Hurricane Irene Hits East Coast Hurricane Irene pounded coastal regions of North Carolina, Virginia and neighboring states as it headed north on a track expected to take the storm right over New York City and into New England later this weekend. August 30, 2011  Hundreds of roads and scores of bridges remained impassable days after the massive storm cut a treacherous swath across 11 states. In some rural and coastal communities, those roads and bridges were the sole access routes. Vermont's National Guard was airlifting supplies to nearly a dozen cut-off towns. August 31, 2011  Because people are more likely to blame public officials if there is a repeat of a previous disaster, officials tend to disproportionately focus their safety efforts on preventing similar disasters in the future, researchers say. So, for example, officials might over-react to a hurricane in light of Katrina, even if the real threat to public safety may lie elsewhere. August 31, 2011  The idea that money spent on fixing the billions in damages will be good for the overall economy is known as the "broken window fallacy," Planet Money's Adam Davidson says. In reality, spending is just shifted around. 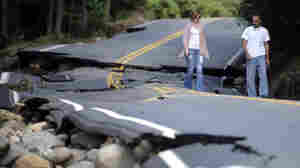 August 31, 2011  Hurricane Irene tore a path through some big coastal tourist destinations. That means some restaurants will miss out on Labor Day, usually a big weekend. 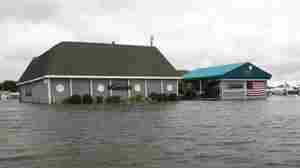 In Monmouth Beach, N.J., Sallee Tee's Grille was flooded. And its chef-manager says it may take weeks to rebuild. August 30, 2011  Two days after the departure of Irene, traveling up and down the East Coast remains a daunting challenge for many. Some air travelers remain stranded at major airports. And passenger rail service is still disrupted between Philadelphia and New York, one of the most heavily traveled corridors in the country. August 30, 2011  Roads and bridges are out in Wilmington, Vt., in the wake of Hurricane Irene. Melissa Block talks with Fred Ventresco, town manager of Wilmington, for more. August 30, 2011  In addition to the frustration of food spoiling in refrigerators and darkened homes, the loss of the Internet is heightening the anxieties of power-less utility customers. In some towns, free WiFi coffee shops have become a hot spot for the disconnected. 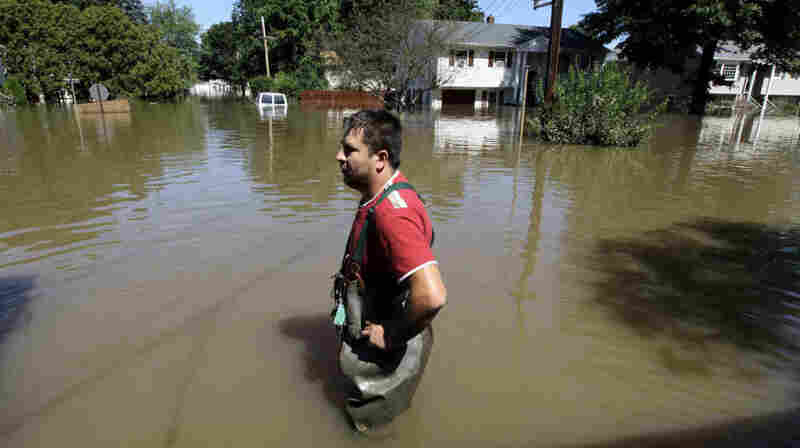 Flash Floods Force Daring Rescue In Upstate N.Y.
August 30, 2011  Parts of upstate New York were hit hard by Tropical Storm Irene — high winds and a wall of heavy rain swept away homes and bridges. Dozens of major highways, including sections of interstates 87 and 90, were closed to traffic. August 30, 2011  President Obama, like every other politician in America, has the lessons of Hurricane Katrina seared into his memory. 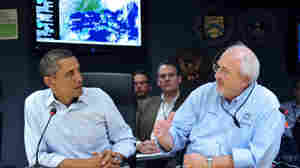 During and after Hurricane Irene, he and his team appeared on top of the situation. But natural disasters are one of the ironies of politics — a competent response won't help much, but an incompetent one can really hurt. August 29, 2011  Irene's sweep up the East Coast caused millions to lose power this past weekend — many of whom may not have it restored for days. And although most mass transit systems are up and running again, long-distance travelers aren't so lucky: They're stranded at airports and rail stations across the region. August 29, 2011  It's still early to make exact pronouncements about how much damage Irene caused, and President Obama says the cleanup in many areas will be tough. But overall, the storm appears to have caused much less damage than forecasters said was possible. August 29, 2011  The death toll from the storm rose to 35 as residents of mid-Atlantic and Northeast states began assessing the damage wrought by the destructive storm. Millions were still without power, and torrential floodwaters threatened towns in Vermont and elsewhere. August 28, 2011  The worst of Tropical Storm Irene has passed New York, but it's still causing havoc in southern New England. The town of Stonington, Conn., is dealing with downed power lines, flooding and fire. Guest host John Ydstie talks to Ed Haberek Jr. Stonington's director of Emergency Management. 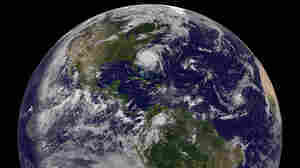 August 28, 2011  Overnight, Hurricane Irene pounded the East Coast from North Carolina to New Jersey. 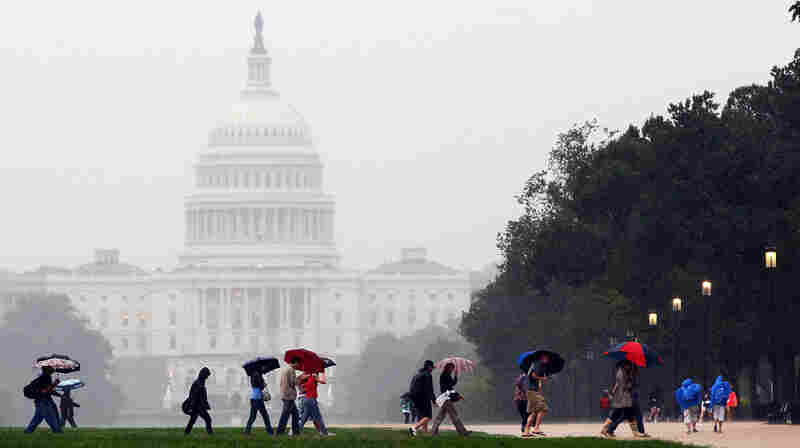 The National Hurricane Center reports there will still be heavy winds and rain for the remainder of the day, although the storm is weakening. As many as 3 million people are without power. 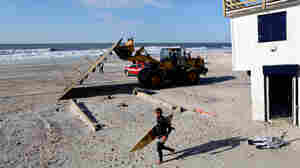 Guest host John Ydstie and NPR's Joe Palca discuss the causes and aftereffects of Hurricane Irene. August 28, 2011  Tropical Storm Irene is hitting New York City Sunday morning, but Saturday night in lower Manhattan, people weren't quite sure what to expect from the storm. NPR's Caitlin Kenney describes what it was like in her neighborhood. August 28, 2011  Early Sunday morning, Hurricane Irene rolled through southern New Jersey. Guest host John Ydstie speaks with Pamela Grites of the American Red Cross Southern Shore Chapter about Hurricane Irene's effects on southern New Jersey. 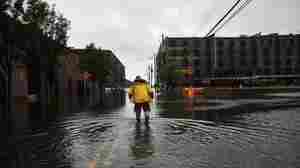 August 28, 2011  Just east of New York City, towns in suburban Long Island are bracing for Tropical Storm Irene. Guest host John Ydstie speaks to Nassau County Executive Ed Mangano about preparations in the area. August 28, 2011  New Jersey's Gov. 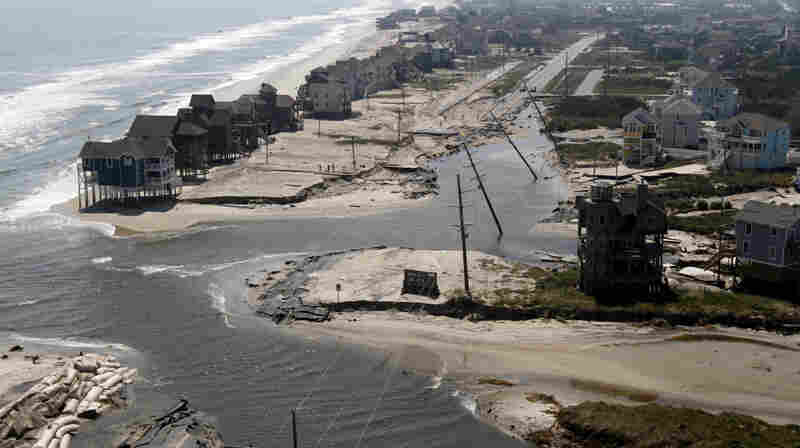 Chris Christie on Friday announced mandatory evacuations for his state's coastal residents as Hurricane Irene approached. He said this weekend was not the time to get dinner in Atlantic City, but the Ducktown Tavern in Atlantic City is intent on staying open. August 28, 2011  Tropical Storm Irene is headed toward New York City, where hundreds of thousands of residents have taken shelter. Subways are shut down and the streets are deserted. Guest host John Ydstie gets an update on the situation from NPR's Jim Zarroli in New York. 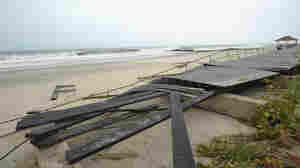 August 28, 2011  Now just a tropical storm, Irene pummeled New York and the Northeast Coast with intense wind and rain. But speaking on Sunday, President Obama said areas are still at risk of flooding and urged people to continue to listen to the guidance of their state and local officials in the coming days. August 27, 2011  Parts of New York City are under evacuation orders, with more than 370,000 people ordered to leave low-lying areas as Hurricane Irene approaches the city. But on Saturday afternoon, at least, some residents were making the most of it. August 27, 2011  But if we want to stay true to the science – which is our best and only hope – then we have to very, very honest about the limits of our knowledge and the range of our ignorance.